To me, Tauerville Fruitchouli Flash is witty — the name alone lets you in on the joke. Rochas Tocade’s raving overdose of vanilla and rose is witty. So is Prada Candy. Everything from Prada Candy’s bottle to its marketing to its name lets you know it’s an indulgence without a lot of nutrition. Somehow, it gains merit by laughing at itself. It’s a fun perfume. Then we come to Prada Candy Kiss. Can a joke go too far? Candy Kiss was developed by perfumer Daniela Andrier. About Candy Kiss, Prada’s website says: “evoking the scent of delicate white cotton, the musk encapsulates the wearer in a sensual cloud, infused with uplifting vanilla and orange blossom nuances.” I don’t know about you, but “delicate white cotton” plus a musky cloud encapsulating anything plus orange blossom sounds too much like laundry detergent for comfort. Add the average consumer’s love of clean fragrances to Candy’s bilious sweetness, and we could be talking a greased pole to a migraine. Well, if it’s “delicate cotton” that has you worried, you can relax. There’s nothing delicate about Candy Kiss. It turns out that my fear of sharp laundry detergent was for naught, too. Instead, Candy Kiss is a blast of vanilla-scented cotton candy riding neck and neck with a juicy orange blossom, with a wisp of girlish white flowers and thick shavings of fancy soap underpinning it. The combination is brash and assertive, like wearing bright pink when you really do better in earth tones. I wore a few vigorous sprays of Candy Kiss to the co-op, and I wanted to apologize as the dreadlocked checker rang up my yams. Candy Kiss has no place among micro-enterprise raw desserts and kombucha on tap. It’s also a disconcerting blend. Gourmands shouldn’t smell clean. Or should they? Remember — okay, this was a long time ago — when a small soda company put out cola in a clear formula? The dissonance was the biggest part of the attraction. Candy Kiss’s vanilla-soap dissonance alone makes it worth a sniff. The fruit of its orange blossom is the bridge that makes the sweet-soapy fragrance work. As Candy Kiss fades over the next several hours, it becomes much more gentle. The orange blossom drops away, and wood joins the caramelized vanilla and clean musk. At this point, I’m tired of it. I get it. Massive vanilla plus soap, ha ha ha. The joke is over. Candy Kiss doesn’t have the beauty or interest to compel me to want to smell more, especially in its feeble (but arguably more traditionally lovely) dry down. If you like Candy Kiss’s wit, I encourage you to try the much less expensive Rochas Tocade, a drag queen cupcake of a scent by Maurice Roucel. Tocade adds rose to its caramelized vanilla and doesn’t mess with Candy Kiss’s soap or orange blossom, but it somehow feels more honest for it. What are your favorite witty fragrances? 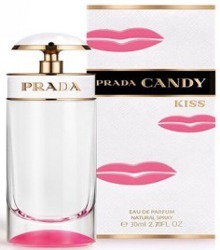 Prada Candy Kiss Eau de Parfum is $68 for 30 ml, $88 for 50 ml and $118 for 80 ml and can be found at department stores. 1. A non-witty fragrance can be worn with wit, too. This notion has sold thousands of bottles of Guerlain Vetiver to women. I get what you’re saying, but I have to think it’s difficult to be witty or ironic with perfume. Not that they can’t be created or worn with that in mind, but difficult to interpret from the smeller’s (as opposed to the smellee) side of things. I would think hardly anyone would get that you’re witty (wearing an over the top fragrance) or ironic that you’re wearing something traditional (when you’re not), or from the 80s (to make a point), etc. I think the smeller will either think you smell great or not. Thus the wittiness is only the smellee’s to enjoy. And since I really just wear fragrance for my own enjoyment anyway, I guess that’s fine. I have to agree with you springpansy. I can’t wrap my mind around wit for perfumes. Either they smell great or they don’t. If they are ‘over the top’ then they are just that – brash – and you either embrace it or you don’t! I applaud Angela for even sniffing and then taking the time to review Candy Kiss. I still hold that perfume can be witty! Like wearing pristine red patent leather shoes with a worn-out old dress. It’s a kind of chic. I struggle with this too. The other week, I was thinking to myself: do I have any fragrances that are fun? What does that mean to me anyway? I will lump witty in there too. I think the closest I get to witty is delightful or pretty. There’s nothing wrong with delightful and pretty! I’ll take it. It’s true that not a lot of people are going to get it when you wear perfume with wit. But it doesn’t mean you shouldn’t do it! If it makes you smile, you should do it. Funny you say joke..it is what I think about Prada Kiss, when I smelled it today. She can’t laugh at her own joke. She doesn’t have the wink. Sadly. I can’t believe we haven’t reviewed Gucci Rush! That must be remedied. I seem to remember that it’s–or was–one of Erin’s favorites – ? She does have good taste! Same thing with clothing, one person’s gardening clogs are another’s fashion statement. It’s so nice to have a soft, fresh, easy scent! I am thinking about this more that you can imagine, lol! I think what is closest for me to witty is rather bawdy instead: a fragrance like laughing too loud, being too bold, enjoying myself too much. I think the closest I get is Chopard Casmir which I own and always loved in very small doses. It is definitely big hat, big earrings, bright colors fun. I recall years ago testing a fragrance that I’ll concede is witty but I never liked it enough to buy a full bottle. It’s the Ferre Rose, which is a lovely bright rose composed by Francis Kurkdjian that has a very unusual watermelon accord. I also like the Jessica Simpson (in the bottle with the feather design), but again, not enough to buy…..
I’m glad the post provoked some thought! It’s been ages since I smelled Ferre Rose. I’ll have to find my sample–I’m sure I have one around. This is a little bit of a cheat because it’s in the name! but I feel like Drole de Rose lives up to its billing on the humor front–it does make me smile in how over-the-top, high-femme it is. On the other hand, the fact is… I don’t really enjoy wearing it. So I don’t know, it makes me wonder, do I think wit’s not necessarily a virtue in perfume? Or at least not sufficient? I want there to be some more sincere appeal as well, I think. I wouldn’t want to wear a witty perfume every day, that’s for sure. Right now I’m wearing Timbuktu, and it’s perfect. There’s nothing funny about it. Ha yeah a good example of the opposite approach! It’s rainy here, and Timbuktu is perfect. For me, Pulp is witty. Or maybe just silly. It’s the Carmen Miranda of fruit perfumes. Oh yeah Pulp’s a good pick too! Perfect! Pulp is hilariously witty (and so is Carmen Miranda). Pulp is one of the few perfumes that made me want to laugh out loud when I first smelled it. It smells exactly like its name. With all the “fruity” scents out there, it is one of the few that actually smells like fruit. Unfortunately, it turns into something rather unpleasant after an hour or so on my skin. If it kept that initial smell, I would definitely buy it. Even if it just disappeared after an hour, I might buy it just for when I need a little pick-me-up. Too bad about your skin! I guess you’ll just have to eat lots of guava and strawberries to make up for missing the smell. Thanks for the review, Angela. Based on your comments, “Candy Kiss doesn’t have the beauty or interest to compel me to want to” even bother trying it, and I am a gourmand lover. I’m anosmic to the original Prada Candy anyway. I’ll keep my Tocade, thank you very much, which I find quite whimsical rather rhan witty. I am a great fan of whimsy! If you have Tocade, you don’t need Candy Kiss, in my opinion. I love “whimsy” as a descriptor! Brulure de Rose and Lipstick Rose are my kind of witty…. or Bronze Goddess on a rainy, cold, grey day. Insolence maybe too! Like a girl with too much of her mothers makeup on. I bet there are more, thanks Angela for making us think about this. I will probably test the new Prada soon just for fun even though the original is not my cup of tea. Okay. No I really want to try this. I’m on bottle number two… Or is it three… Of the original Candy and also wear and enjoy Pink Sugar as well. I’m not the target market for either one I don’t suppose, but they’re fun, uplifting and help lighten up the day which is all I want sometimes. Hey, you might love it! Let me know if you get the chance to sample it. Gosh, I tested Candy Kiss and all I could smell was the clean musk. I will try again to get the vanilla. I like MJ Decadence for a witty perfume. It is very over the top sweet, and the bottle is pretty gaudy, but I wear it when my alter ego wants to be big and loud and fun. As a perfume lover, I assign characters to my scents, that’s how I pick my SOTD. Who do I feel like today? and what does she smell like? I got loads of vanilla–do try it again! I love your method of turning your fragrances into personalities. Imagine the party they’re having in the perfume cabinet right now! Everyone should have one of those! Such a thought provoking subject! There is much wit in how you wear perfume. I was thinking about this on the way to the bus this morning. EL’s Knowing would work better in well-cut jeans and a cotton shirt, because any meaning it had as a corporate, boardroom fragrance for 80s alpha females has surely been exhausted now. And if you are going to wear Bvlgari Black with leather, wear the jacket over a floaty pink dress, and paint your nails! Guerlain Vetiver on a woman – yes. Wit lies not just in exaggeration but in unexpected contrasts, is I suppose what I’m saying. I hope you like The Booster Club! “Knowing” was designed as a “power suit fragrance”? Color me embarrassed! Ever since purchasing a vintage mini of it, it’s become my favorite “long afternoon in bed” scent! Maybe you’re power napping with Beautiful! And that’s hilarious about Putain des Palaces. Ha! Well, I’m going on the fact that Knowing is a powerful chypre, the last hurrah (I think) of those 70s chypres for women who finally had their own jobs and could buy their own fragrance without referring to anyone’s taste but their own. And one of the TV ads for Knowing includes a pair of shoes that would put the fear of God into a lot of men … and women too actually. It really did take the notion of Charlie and give it class and glamour–and roses. Oh, and Pauline Porizkova in a tuxedo! Amazing. It was because of Paulina that I even wanted to smell Knowing. I still love her and she is still amazing. I still think about that image! I tested this in Sephora today. It’s pleasant, lots of vanilla and musk. I wouldn’t buy it as I have other scents in this category that are much better, but I enjoyed trying it. I an not a fan of the Prada Candy line but I do admire their marketing,. From a Nouvelle Vague cinema feel in the first flanker, a Barbarella vibe in another flanker and now to this Françoise Hardy lookalike.